This Handbook measures 150mm x 220mm x 8mm with the scan comprising 76 pages including front and rear cover. The cover is a thick purple card with a heavy bark like impressed finish and was printed by Dixon & Stell, Cross Hills. 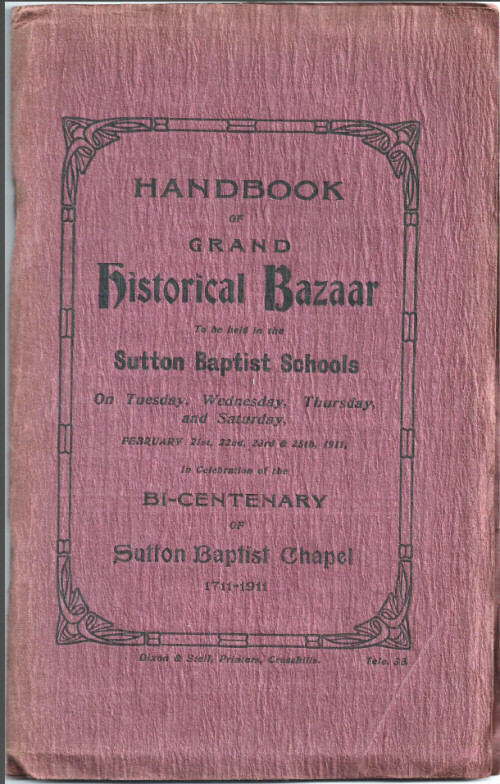 The rear cover advises that the Sutton Baptist Chapel Bicentenary Souvenir 1711-1911 booklet (published separately in the Gallery) was on sale at the Bazaar but no cost is quoted in either document. The Bazaar was held on the 21st, 22nd, 23rd and 25th February 1911 with a specific objective of raising £1,500 to meet the cost of building alterations (see page 3). Separate opening ceremonies were performed on each day by a different celebrity including Sir George W Macalpine - President of the Baptist Union - who carried out his duties on the 23rd February. The 77 page handbook can be downloaded by clicking the image below. Please note that the PDF file is 22 megabytes in size and may take a while to download.